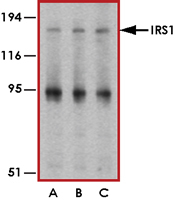 Sample Data :Western blot analysis of IRS1 in PC-3 cell lysate with IRS1 antibody at (A) 1, (B) 2 and (C) 4 ug/ml. 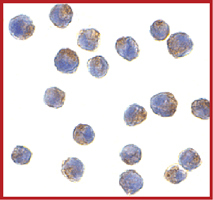 Sample Data :Immunocytochemistry of IRS1 in P815 cells with IRS1 antibody at 2 ug/ml. Scientific Background :IRS1 is the substrate for the insulin tyrosine kinase receptor and is found in a variety of insulin-responsive cells and tissues. IRS1 protein has no intrinsic enzymatic activity but acts as a docking protein, via the SH2 domains, for mediating the insulin downstream signaling events. IRS1 has been shown to associate with the 14-3-3 family of proteins and this could play a role in the regulation of insulin sensitivity by interrupting the association between the insulin receptor and IRS1 (1). IRS1 may be associated with colorectal cancer and diet and related factors may affect the risk by modifying plasma insulin levels. Thus, the inter-individual variation in insulin signaling mediated by IRS1 may play a plausible role in the development of colorectal cancer (2). 1. Ogihara, T. et al: 14-3-3 protein binds to insulin receptor substrate-1, one of the binding sites of which is in the phosphotyrosine binding domain. J. Biol. Chem. 272: 25267-25274, 1997. 2. Slattery, M.L. et al: Genetic variation in IGF1, IGFBP3, IRS1, IRS2 and risk of breast cancer in women living in Southwestern United States. Breast Cancer Res Treat. 2007.